Anyone watching this? It's been really good in my opinion. Though it's gone in a direction that I didn't really expect it to. I haven't, sorry. Is it actually about Archie and Betty and Veronica? The commercials looked super dark and completely unlike anything from the Archie comics. It's way more early Pretty Little Liar than traditional Archie...but not quite as good as Waid's reinvention. As CW fare goes though, it got off rocky but is taking a very Twin Peaks turn to the dark and I like it. If Riverdale wants to be the new Twin Peaks, why isn't Hiram Lodge the town's Ben Horne to Veronica's Audrey? Should I be watching it? Dagnabbit, why must Riverdale actually be good? It's actually surprisingly good. I didn't expect much from it at all. I know the actress that plays Grundy is about a decade older than Archie's actor in real life, but it's jarring that she's not a student since they both look the same age. Odds on Betty having killed Jason in a fugue state? I do like Betty and Veronica though, wayyyyy more than I do Archie. Their friendship is so awesome amd truyhfully if they got together and didn't date Archie I would ne totally fine with that. Archie is a less boyish, less charming, and less wordy Dawson from Dawson's Creek. I'm still on the fence on Juggy, although I hope they make him asexual here too. Cheryl is channeling the best of high school queen bee like Cordelia, I love how she chews scenery but seems to have layere too. I liked that they made a d-bag privileged kid Black. I always appreciate when Black characters are allowed to play all roles and not just what some people see as positive or negative. I'm still not happy about Josie and the Pussycats. I don't necessarily mind them all being ablack but the actress playing Josie isn't my pick for that character. She could have played Mel and they could habe gotten another actress who feels more natural as a leader with diva-swag (and with red hair, Black women dye their hair too). Moose is bad being closeted gay bully jock lol...Kevin borders on early 2000s gay bff cliche but he has charm that I appreciate. Chuck Clayton is a 180 from his comics persona. They've said Jughead won't be asexual, although the actor is pushing it. To be fair, the show was already in production when they made Jughead canon asexual. I like Cheryl's giant spider brooch. Is Dilton a high schooler or older? The killer is Pop Tate, who just wanted to give his best customer, Jughead, a topic for his literary debut! Jughead's dad is a crimester!? I don't understand why I find this as shocking as I do. So Jughead's crimester dad didn't sell Jelly Bean to the Spellmans in exchange for a sweet motorcycle? I wanted Edward James Olmos for Hiram Lodge but they cast Mark Consuelos. Should Dove Cameron be Sabrina? Clifford Blossom didn't really kill his son. It was Bob! Just ask Leland Palmer. It’s still way better than grimdark Archie ought to be. I've never agreed with you more than I have at this moment. I’m going to be so mad if they finally introduced Midge just to kill her & Moose! First arson now art: Is there anything Cheryl Blossom doesn’t excel at? The Chilling Adventures of Sabrina TV show is slated for Netflix not The CW, so will Sabrina not appear on Riverdale at all? The show’s been hinting at how spooky Greendale is, so it’d be disappointing it didn’t finally feature her. Or will the shows be out of continuity to each other so there will be two new Sabrina Spellmans cast? Riverdale has too much tonal consistency! So Dilton is the new Midge? 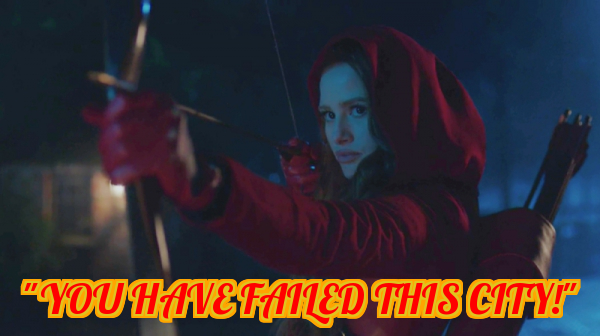 Can Cheryl be transferred to Legends Of Tomorrow? They don’t have an archer, & it’d allow me to cut a show out of my schedule. Finally finishing up Season 2 and the entire time I feel like I'm watching a horror movie when it comes to Archie. Every time he does something I'm just like "You're a damn idiot. Stop that!" 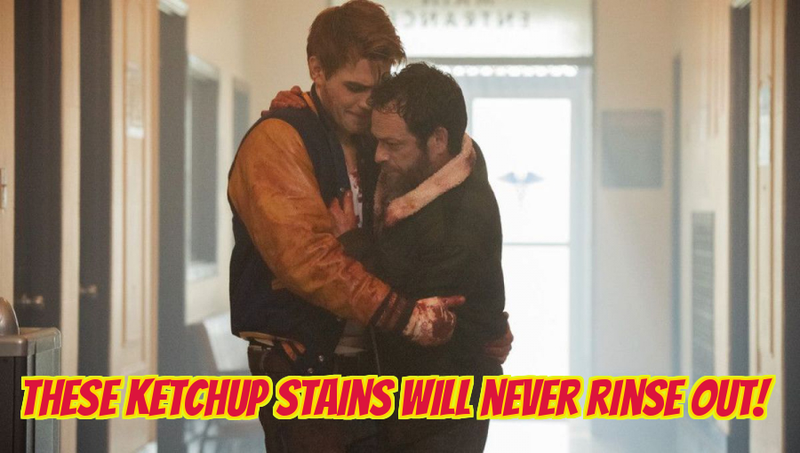 At this point Riverdale is less an Archie adaptation than full-on Stephen King fanfiction. Looks like next week is John Hughes fanfiction, from the previews/commercials. The Breakfast Club episode had its share of It also. Oh I guess it already aired, that's the one I was referring to.